While I do not do a lot of work in black and white, every once in a while a photograph seems to beg for a more timeless look. 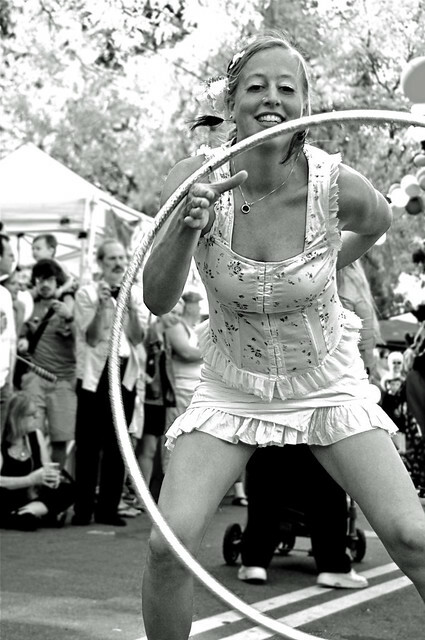 This shot of a hoop dancer, again from the Willy Street Fair, was one such. The day was bright and it was nearly noon, so everything was pretty harsh and generally washed out with blown highlights. So I opted to accentuate that and worked to take it to sort of an infra-red feel. Other than the conversion from color to black and white, I used Photoshop - a tool I use sparingly - to to add some more blur to the background to make her pop a little more and to reduce some bruises. She is taking aerial dance classes with the troupe I am part of, and she has been working with me on poles (ours are steel, and mounted from the ceiling rather than the floor) which are pretty unforgiving and we all sport a collection of alarming bruises on our legs and thighs, and the inside of the upper arms. In context, they are a badge of honor. In a photo like this, they are a distraction.